Dr. Salomon Nahon is devoted to his patients, treating each with the utmost compassion and respect. His kindness, commitment to personal care, and gentle approach to dentistry keep his patients smiling. 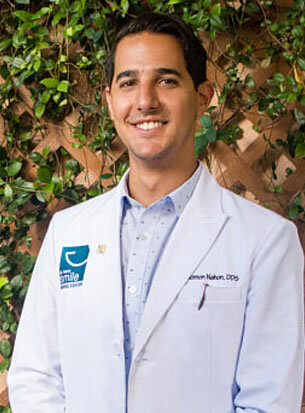 Born and raised in Miami, Dr. Nahon is glad to be serving the community where he grew up. He has been motivated by a desire to treat the patients of A New Smile with the same quality of care that they have come to expect. He is thrilled at the opportunity to do so, as well as the opportunity to meet new amazing lifelong patients and friends. Dr. Nahon received his Doctorate of Dental Surgery degree from the University of Maryland Dental School. During his tenure, he was a member of the Executive Board of his class as well as a member of the Alpha Omega professional dental organization. Understanding that education does not stop at graduation, Dr. Nahon places great importance on continuing education for himself and his staff. Dr. Nahon is an active member of the American Dental Association, Florida Dental Association, South Florida District Dental Association, and Academy of General Dentistry. He has also achieved Premier Provider status as a top Invisalign doctor in the region. Dr. Nahon enjoys attending conferences and seminars, helping him stay at the cutting-edge of developments in technology and techniques. He prides himself in providing the highest possible quality of care for his patients. When he’s not working, Dr. Nahon enjoys spending his time playing basketball at the JCC, wakeboarding in Biscayne Bay, or going to Heat games. His ability to speak Spanish, French and Hebrew enable him to relate to his patients on a more personal level. Here's what our patients have to say about Dr. Nahon!